A large proportion of Internet usage is now done by mobile phones and tablets. The mobile internet is growing rapidly and most people now use their mobile handset to access the internet. 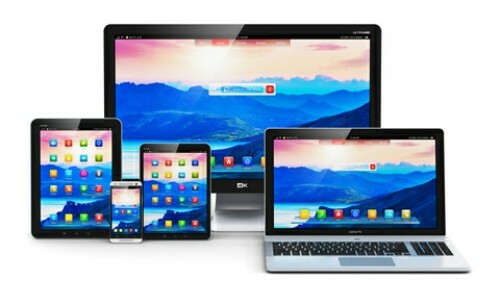 According to StatCounter, by February 2019, UK desktops accounted for 52% of internet usage compared to 38% for mobile and 10% fortablet. Is your website mobile phone friendly ? On a mobile phone screen, some websites are too small to read. They need to be enlarged and you have to do some difficult scrolling around to find things. As a result people often just give up and search for a website that is easier to view. Mobile phone friendly websites are simpler and easier to see - the text is instantly large enough to read and you only need to scroll up and down. Google favours mobile friendly websites! A responsive website is one that changes it's layout depending on the device you are using. Additional coding allows the website to change it's layout so that it is of a readable size even on mobile phones, tablets, ipads and takes away the need to scroll horizontally - regardless of the screen size (see image). I include full responsive coding with all my new websites. Converting older websites to reponsive design can be done but may involve completely recoding it - depending on when it was originally built. Those using 'css' can be converted, but those that use 'tables' would need a Bespoke Mobile Phone website. Bespoke mobile websites tend to be quicker to load than responsive design websites but need more work to complete. If you already have an older website, it may be a cheaper option to simply add a mobile version than to start from scratch with a brand new fully responsive website. The disadvantage is that any updates required need to be done on both websites. Mobile users can telephone you directly from their smart phone by simply tapping the phone number on the page - instant contact ! Printed QR Codes look like big square bar codes - mobile phone users can simply scan the image with their phone and find your website. Every website has it's own unique QR Code which when scanned using a mobile phone immediately connects the user to your website. Use on business cards, stationery, products, adverts, vehicles, signage - anywhere. Whenever people see your QR Code, they can simply scan it with their phone and your website appears.